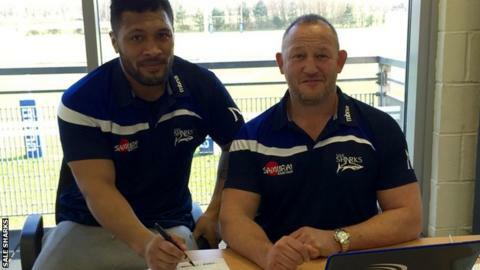 Sale Sharks centre Johnny Leota has signed a new two-year deal with the Premiership side. The 32-year-old Samoan centre joined Sale in 2011 from New Zealand provincial side Manawatu and recently passed 100 appearances for the club. Leota, who also had a stint at Super Rugby side Highlanders, played at the 2015 World Cup for Samoa. "He is strong in the tackle and loves to attack too," said director of rugby Steve Diamond. "His try last weekend against Saracens was one of his trademarks." Leota's wife Liana moved to the north west last year to play for Superleague netball side Manchester Thunder. "I have thoroughly enjoyed my time with the club and my family are settled," he added. "I am looking forward to playing my part at the club for the next two years at least."